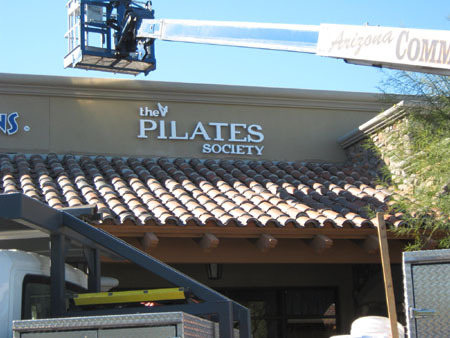 Arizona Commercial Signs is proud to be one of the largest interior & exterior sign installation experts in Phoenix, AZ. We are the “best of the best” sign installers and can install your exterior or interior business or commercial sign. This comes from our experienced and professional technicians, our well maintained equipment, and a commitment to complete customer satisfaction. Signage installation take places in many different types of environments and every location may present its own unique challenges. That’s where our creative problem solving and quick thinking come in. With our modern trucks and cranes, we will perform the installation of high rise signs, monument signs, pole signs, led signs, restaurant signs, exterior building signs, business signs, channel letters, neon signs and much more. Our sign installation equipment gives us the capability of installing nearly any sign, big or small! With our 20+ years of experience in designing and installing commercial signs, you can be sure that your sign will be installed right the first time around! Our signage installation experts are highly skilled and undergo rigorous safety/education training before ever stepping out into the field. Our commitment to training and safety is your peace of mind when your sign is going up. Not only do we design, fabricate, and install new signs but we also offer maintenance and repair for the signs you already have, even if you didn’t get them from us! View our sign installation gallery to see pictures of some of the signs we’ve designed and installed. If you are interested in receiving a quote for installing your interior & exterior commercial signage in Phoenix, AZ, give us a call Today at (480) 921-9900 or visit our contact page to fill out our contact form.